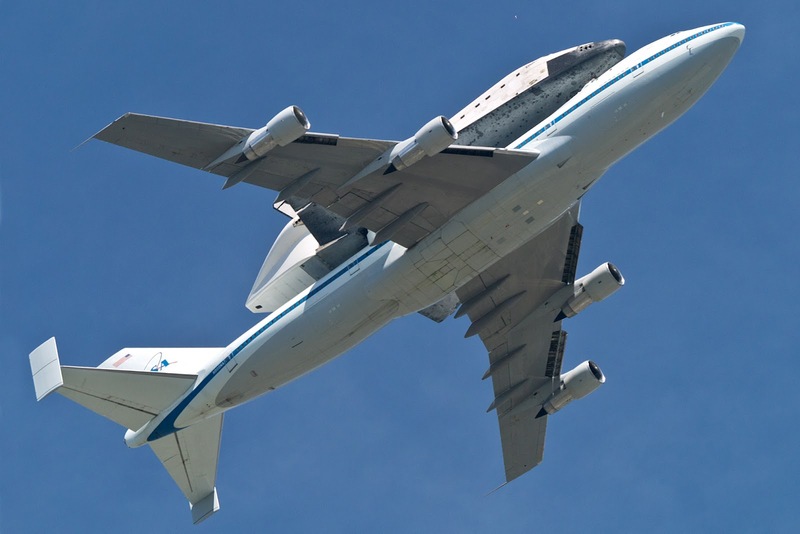 Today, 21 September 2012, in a spectacular display of flight, NASA sent the space shuttle, Endeavor (OV-105), off on a tour of California, via piggy-back on a Boeing 747, before arriving at its final touch-down destination at Los Angeles International Airport (LAX). From Sacramento to San Francisco, Huntington Beach to Los Angeles and many points between, millions of people flocked to the streets to witness this once in a lifetime sight — the shuttle Endeavor in its last flight before permanent retirement at the California Science Center in Los Angeles, California. 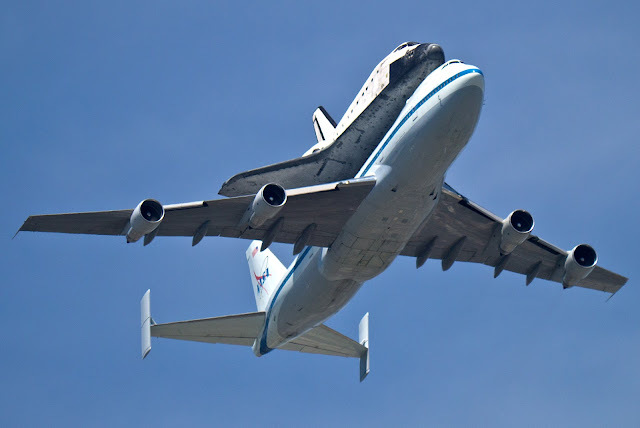 Next month, starting on 12 October, the Endeavor will be transferred to ground transport and make the final 12 mile leg of its journey through the streets of Los Angeles from LAX to the California Science Center. The Endeavor was the fifth and final space shuttle to be manufactured and used in NASA's Space Shuttle program. The program was employed from 1981 to 2011. 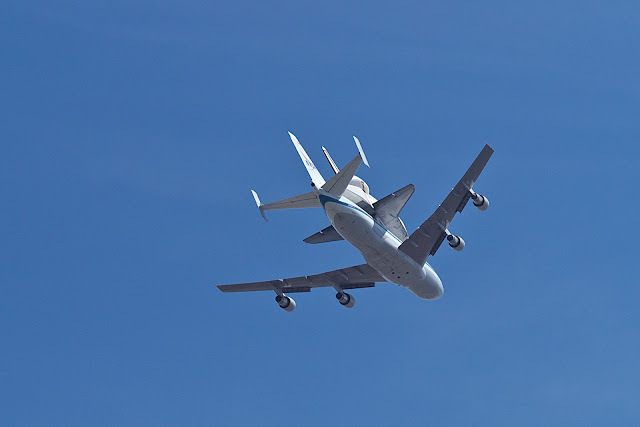 With the Endeavor's touch down today at LAX, it closes the final chapter in the shuttles' flight program. 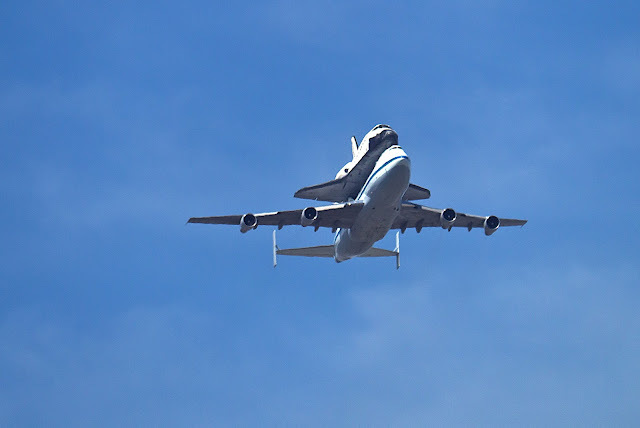 I am fortunate to live in an area that was in the direct flight path for the Endeavor's airshow. As a matter of fact, looking at the pictures I took above, I could have hoped to get a better profile view of the shuttle and 747, but I dare not complain; little did I suspect that the flying duo would travel [almost] directly overhead of my vantage point. I had loaded my longest lens for the event and realized, during the occurrence, that perhaps the 300mm end of the lens' 100mm-300mm range was perhaps too much for the proximity I was photographing from. It was an amazing day. Being able to observe this historical event, the closing of this stage in the space program, was truly a thrill for this luddite. I have followed the space program from the Mercury Missions to the Apollo Missions and now to this era. As a species, we have come a long way, but there's still more out there to explore. Here's to the future of space exploration and the furtherance of the science that will get us there. With our feet firmly planted on the ground, who knows how far we can reach. 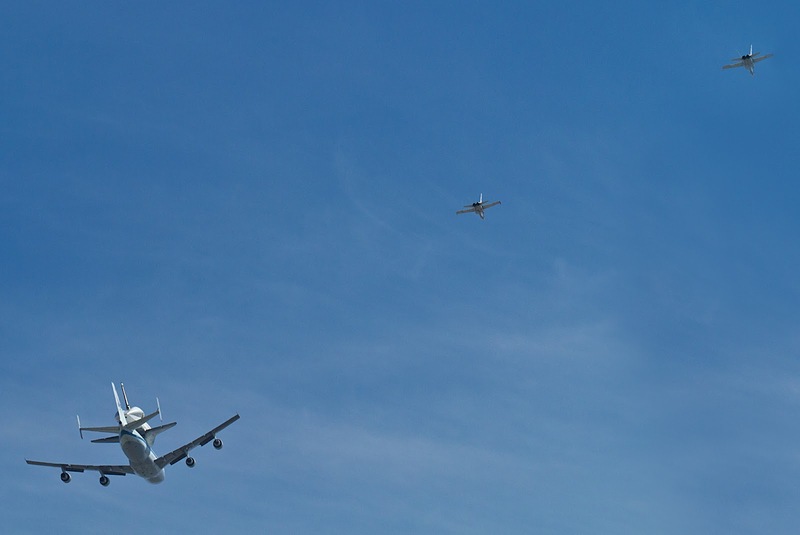 Side note: In the third picture from the top, you can see a tiny spec in the sky above the shuttle [about two thirds to the right, top of frame]. That is a balloon; most likely an escapee from nearby Disneyland.